After a long summer hiatus, we are back with the third issue of RocketSTEM magazine. This issue marks the last of our large quarterly issues. Our fourth issue will be released in early November. • The Voyager 1 spacecraft has entered interstellar space. • An interview with British cosmonaut Helen Sharman, the first European woman to rocket into space. • LADEE launches toward the moon to study the lunar atmosphere. • Orbital Sciences Corporation makes its first delivery to the ISS using the Cygnus spacecraft. • This month’s edition of our astronomy guide helps you recognise the night sky. • A light-hearted question and answer session with Hollywood actor and space geek, Seth Green. • And much, more more. Sixty-eight pages of pure content. No advertising. Educators may reuse the magazine’s material in their classrooms, however, no commercial use or other reproduction is allowed. And as always, every issue remains free to read online or download as a PDF. NASA launches new mission to study the thin atmosphere of the Earth’s Moon. It’s been a long journey for Voyager 1 as it has exited the solar system. The route to becoming the first European woman in space went through Russia. Orbital Sciences Corporation successfully docks the Cygnus cargo spaceraft with the ISS. The hardest working man in Hollywood shares his love of space travel and sci-fi. 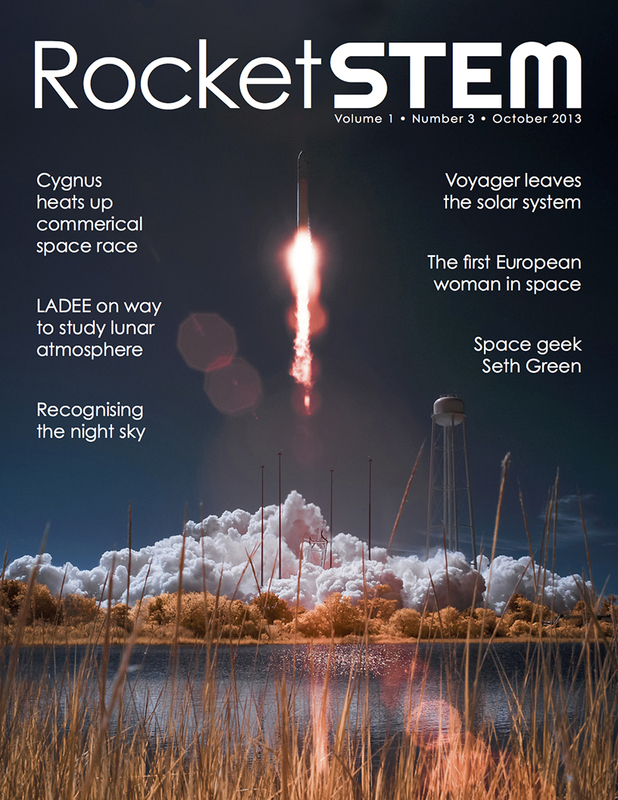 Front cover of the October 2013 issue of RocketSTEM magazine, a free digital publication.